Ski in-ski out, op slechts 200 Yards naar Quicksilver Lift! Uitstekende locatie voor de stad en skiën. Derde verdieping eenheid met uitzicht op de bergen met drie zijden van glas voor het bekijken. Twee blokken naar de belangrijkste straat en de winkelcentra. Uitstekende staat en periodiek geactualiseerd. Ideaal voor het hele gezin, tweede slaapkamer boven voor kinderen. De Condo heeft 1 koning beneden, boven 1 Queen, Trundle bedden. Volledig uitgerust met Jenn Air bereik, vaatwasser, magnetron en alle kookgerei. What a find! Lots of space for the money. Very comfortable and convenient to slopes and town. Wonderful location, very large and clean condo. Perfect for a family vacation! Your condo is beautiful, clean and very spacious. It was very affordable and had the best gas fireplace we've ever seen. It was no problem walking the 200 yards to the Quicksilver lift. We definitely plan to stay again! The owner was very quick to respond to questions and also sent us the key code for the condo and pool well in advance of our stay. The only suggestion we have would be to have a booklet with cleaning requirements, where garbage and pool is located, etc. We saw a little info on the back of the door, but not everything was included on there. Thank you for a wonderful stay! This is not the Ritz, but at the price a really great find. Yes, it could use some updates, but it’s very comfortable and has everything you need for a great ski vacation. Comfortable for 4, but you could pack 6 people in if you wanted to. We thank you for your comments. We do some updates every year. We think as most real estate people. Location location location. We try to keep the unit in good condition. We keep it furnished as to be like home. We have several repeat tenants every year. Thanks for all comments. The owners were delightful to work with and addressed all of our needs/concerns. Location of condo is acrossed the street, down a small hill, over the Maggie Pond bridge and up to the Quicksilver lift- very close. Community hot tub/pool across the parking lot which is very nice. There was always plenty of parking. The free common laundry if on the 1st floor of the complex and was always available. The condo is on the top floor with 2 flights of stair to reach it - not a problem for us but could affect others. Top floor units are great to reduce noise from other units. Windows galore with pretty views of snow collecting in the trees. Furniture was ample and clean. It is a bit dated as noted by others but creates a cozy, comfy feel. Kitchen was adequate with dishes for easily 10. We purchased a few kitchen items that were specific to our needs. A few extra kitchen towels and some measuring spoons/cups would be a nice addition. Ski storage downstairs was wonderful and we had plenty of hooks inside the unit for all the layers. Bathroom has sink area outside of toilet/shower area which helped while our family of 4 got ready. 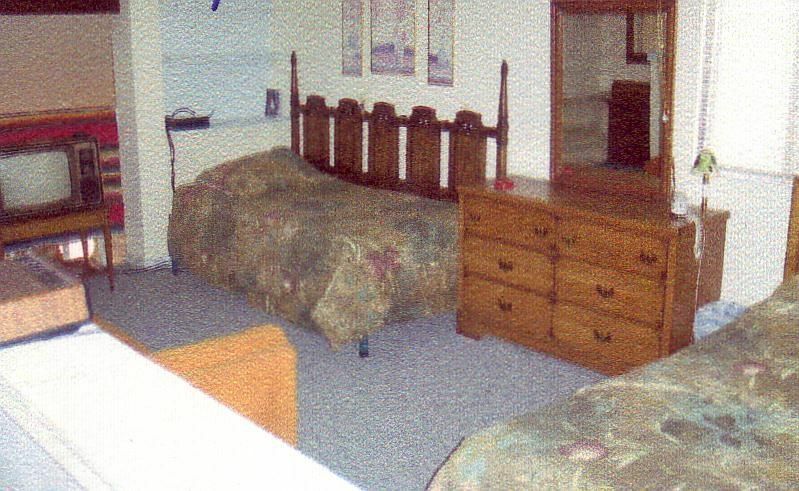 The loft has a queen bed, twin trundle bed, loveseat, chair and 2 dressers. Master bedroom has king bed with dresser, nightstand, small storage area and closet. We brought our own pillows. We will definitely stay here again and recommend it to someone looking for a comfy, convenient place to stay. Thanks for all the comments. The tenant took good care of the unit and wass very nice about any thing that they needed for the long stay. It took several calls for us to ever get a code to get in the condo and when we entered, it as like we time traveled back to 1979. The “frequent updates” that the owner assured us of after seeing the pictures of the condo must mean the first issue flat screen tv circa 2007. The place had blood stained sheets, the furniture was worn out and the bathroom was tiny. Like if you were above average weight, you would have a hard time in there. Oh and the light burned out and for two days we waited for them to fix it. They didn’t, we finally did it ourselves after searching for a light bulb! The towels were nice. It’s located on the third floor with no elevator. The walk to quicksilver lift was about 500 yards. It served our purpose and it was cheap, but next time, we will fork out the extra money for a clean updated condo. Op loopafstand van winkels in de binnenstad, op 2 blokken. Dicht bij activiteiten Riverwalk. Gratis wifi.